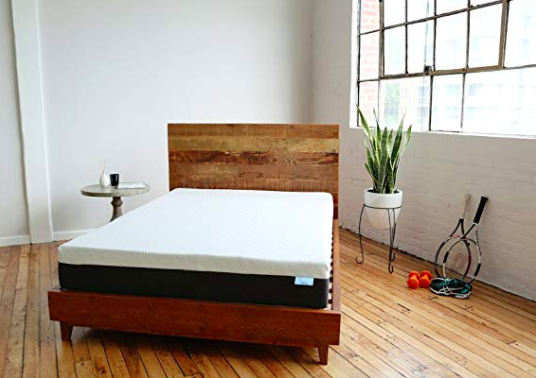 Make sure to check bear mattress reviews, this is a deeper dig into its features to find out how good is its memory foam and how this compares to other brands. We chose some similar products that are currently available on the market to see how they compare. Read on to see how the Purple, Nectar and Casper mattresses in a box compared to the Bear mattress reviews. The Bear Mattress has minimal off-gassing when opening the box, which is to be expected. But any smell dissipates within just a few hours. The triple foam construction of this mattress provides comfortable sleep in all positions. It quickly reacts to changes in position, and it does not cause the feeling of being stuck in foam that is typical for many memory foam mattresses. There was an average amount of sinking and there is a moderate amount of motion transfer due to the responsive memory foam layer, but it is nothing too serious to disturb your sleep. The mattress sleeps fairly cool due to its use of the graphite gel-filled memory foam. It not only encourages faster muscle recovery but also prevents heat retention to create a cool and comfortable sleep surface. It gets high marks in our sleeping cool evaluation due to the excellent combination of these two technologies. Edge support is the support your mattress has around the edges and without it, you may easily fall off when you near the edges. When you sit on the edge, the Bear Mattress sinks in quite a bit so if you sit on the edge of the mattress a lot, a foam construction may not be your top choice. Top comfort layer is constructed of 1″ of graphite-filled memory foam that is designed to provide comfortable cooling. This foam has proven to be 7 times cooler than conventional memory foam. The middle support layer is made of 2.5″ of foam that provides responsive support and relief from pressure. The proprietary foam provides quicker responsiveness when changing positions. Bottom foundation layer is made up of 6.5″ of core-support foam that delivers firmness and serves as the foundation for the other layers. Very heavy weighing 70 to 100 lbs. You will notice some off-gassing, but it isn’t anything unbearable. Try opening a window in confined spaces and avoiding the area if you have a sensitive nose. Allowing this mattress to breathe for three to five days is beneficial. The triple foam construction of this mattress provides comfortable sleep in all positions. It quickly reacts to changes in position, and it does not cause The Purple mattress provides a universal feel that covers comfort for all positions. People who sleep on their back enjoy impressive lumbar support while side sleepers enjoy a subtle give at the hip and shoulder. mattresses. Vibrations were quickly absorbed making this a great choice for light sleepers. Traditionally, foam mattresses hold in more heat. With this construction, extreme airflow is created to draw heat away from the body. Its cover also adds an extra element of cooling benefits. Edge support is an important aspect when buying a new mattress, and this mattress may not be the best option for quality edge support. 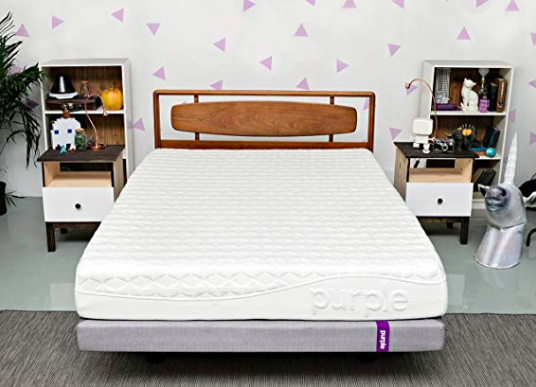 According to our Bear Mattress reviews, the Purple mattress has become popular partly due to the company’s appealing marketing and great reviews. The company produces a quality product and has created an online challenge involving eggs that went viral. This mattress has been designed for pressure relief and exceptional cooling aspects. The Purple mattress has three layers of high-quality materials that total 9.5” thick. Smart Comfort Grid is a 2” thick layer designed to cushion you where you need it most and provide maximum airflow that disperses heat to regulate temperatures. Plush Comfort Foam is the 3.5” thick transitional layer that increases the reaction and feel of the grid layer. Support Foam is the 4” thick bottom segment of the Purple that adds strong support for proper spinal alignment. It’s topped off with a Responsive Knit Cover that breathes and maximizes flexing for perfect comfort. There is no noticeable smell when opening the box nor is there substantial off-gassing and odor with this mattress and any smell present disperses within a day. The top layer provides a soft and flexible sleeping environment, and the layers below contour to the body during sleep. The Nectar does not sink too much when lying or sitting on the mattress due to the density of the foam layers used in its manufacture. Motion transfer is almost non-existent due to its all-foam construction that reduces transfer when changing positions or getting in and out of bed. This mattress does a good job at reducing heat and removing sweating and the sticky feeling found with other memory foam mattresses. Edge support with this mattress is also fairly good, as it stops you from rolling off the bed when sitting near the edge. 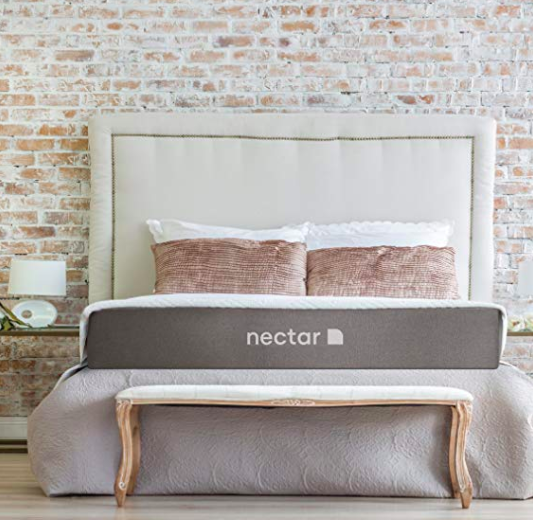 The Nectar is an 11″ thick all-foam mattress made up of 4 layers. Top Comfort Layer is 1″ of foam that is stitched into the cover to increase airflow, provide relief to pressure points, relieve pain, and provide a luxurious feel to the top. Support Layer is 1″ of patented semi-open quick-recovery gel memory foam that provides support and aids cooling and comfort. Transition Layer is 3″ of cooling gel that helps to cool and acts as an intermediate support layer between the upper and lower ones. Foundation Layer is 6″ of high-density foam that delivers deep compression support and serves as the base. The cover of the Nectar mattress is soft cotton that is more absorbent, soft and cool than many other covers. The Casper mattress rates high in this category for not having too much of an obvious smell when opening the box. There was also noticeably less off-gassing which was rather surprising given its all-foam construction. The new Casper mattress is comfortable due to its highest-quality foam layers. The responsive foam layer provides the bounce and responsiveness you desire when switching positions. Although sinking largely depends on weight the Casper does a great job at stopping excessive sinking. The mattress is responsive without causing extreme motion transfer, which makes it a particularly good choice for couples. The open-cell foam used in the top comfort and cooling layers helps improve airflow and prevent heat retention for a cool night’s sleep. Overall, the edge support is pretty impressive making this a good mattress for couples. 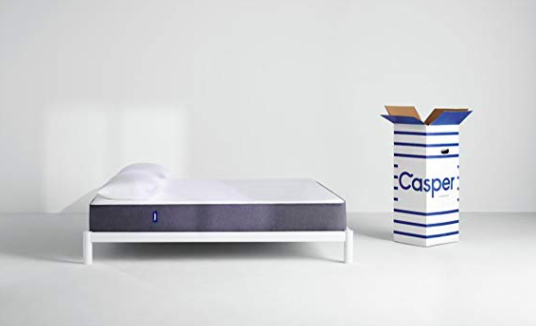 The Casper mattress is a 10″ thick foam mattress comprised of 4 layers. Top Comfort Layer is 1.5″ of special foam created to provide cooling and comfort. Response Layer is 1.5″ of reactive memory foam that provides a bounce. Support Layer is 1.5″ of memory foam that delivers multi-regional support to the areas of the body where it is needed most. Foundation Layer is 5″ of durable support foam that acts as the base and delivers deep compression support. The cover is made of a thick and soft synthetic blend that goes back into place quickly and won’t squash up when you shift positions. In the past, when you bought a new mattress, you had to drive around searching aimlessly for the best deal, test out a dozen different mattresses in various showrooms by actually lying on them as an overly-zealous salesperson lingered nearby. Some people fail to see the value of bear mattress reviews and then shell out a few thousand dollars for a bed that you would likely continue to sleep on for almost a decade. But now there’s a new phenomenon - advanced technology that allows businesses to ship exceptional memory foam mattresses - in a box the size of a small refrigerator - to your home. It’s often referred to as the "mattress in a box", and it's altering the mattress shopping game. Some mattress-in-a-box companies have pretty incredible marketing campaigns, which are creating some doubt regarding the quality of materials used and the benefits the mattresses deliver. While the Bear brand certainly isn’t unheard of, the marketing is done at a lower level than some of its competitors. Continue reading our Bear Mattress reviews to see how they compare to some other brands on the market to determine which one is the better choice. What Is A Bear Mattress? The Bear mattress is 10” thick and is constructed using four layers of high-grade foams. Because it has a slightly firmer feel, this bed is comfier for most sleeping positions. Fabricated with entire body recovery in mind, Bear utilizes some newer technology to support healthy sleep. The cover uses a special copyrighted additive called Celliant to increase oxygen levels and diminish pain. The Bear contouring delivers pressure point relief, and it has a responsive layer that keeps you from feeling trapped. The firm base foam provides plenty of support. Because it is entirely engineered for performance, the Bear mattress will help keep you in great shape. The parent company also donates a percentage of its profits to a children’s health program. Bear Mattress reviews indicate that the pricing for the Bear mattresses typically ranges from $ for the smallest size (twin) to $$$ for the largest version (California King). There are plenty of online coupons, so do your research! According to our Bear Mattress reviews, the Bear Mattress is designed for those who lead an active lifestyle and who are looking for a memory foam mattress that sleeps cool and provides a nice amount of bounce. It’s a great choice for couples due to its cooling features although this also does cause a small degree of motion transfer. Of all the mattresses we have tested for our Bear Mattress reviews, the Bear by far sleeps the coolest and is one of the few mattresses to utilize the notable Celliant technology in its construction. Taking everything into consideration, the Bear mattress is very high quality and makes good on its promises. Hopefully, our Bear mattress reviews help you evaluate this great mattress! Memory foam feels without the feeling of being confined. The layer of memory foam within this mattress lets you change positions while not causing the feeling of being stuck, which is generally the case for most memory foam mattresses. A cool-sleeping mattress. The distinctive design of this mattress that combines the graphite gel-filled memory foam and the patented cover does a great job at controlling temperature, thereby keeping this mattress cool throughout the entire night. To lead an active lifestyle. The cooling technology included within the cover converts body heat into infrared light, helping muscles recover, and ensuring a superior sleep, making this mattress an ideal choice for people who are athletic and who enjoy an active lifestyle.